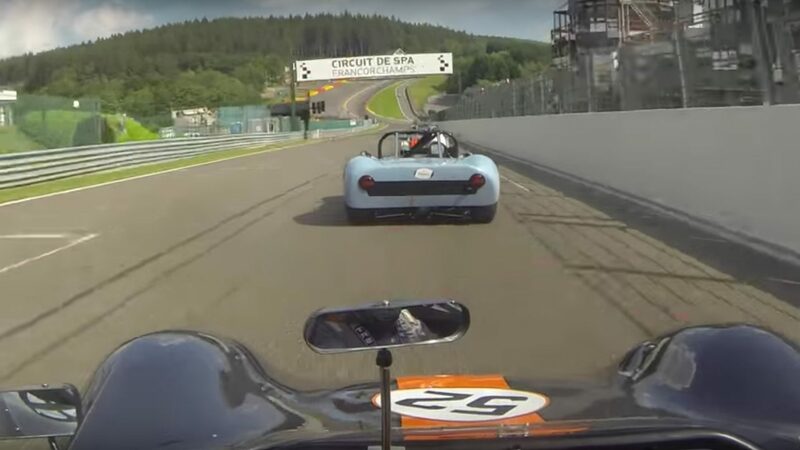 Once again the Crosslé Racing Drivers Club headed south towards the Ardennes Forest and the legendary Spa Francorchamps Racing Circuit. 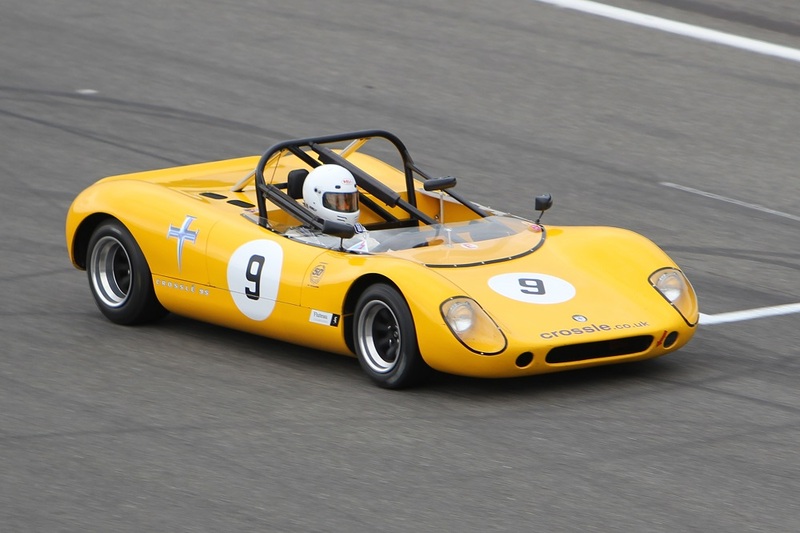 The Crosslé 9S has a proud track record in the Spa Ardennes challenge race which traditionally attracts up to 70 sports and sports racing cars from all across Europe. Traditional cars such as Corvettes, Mustangs, TVRs, MGs, Healeys and Alfas mix it with out and out racers such as Caterham CSR and R300, highly modified Ram Cobra, Ford GT40 and of course the Crosslé 9S. The track was dry and not too warm, this meant good conditions for a quick time and certainly the very well driven Caterham CSR took full advantage grabbing pole position with a 2:42.108, beating last year’s pole by close to a full second (Chevron B6). 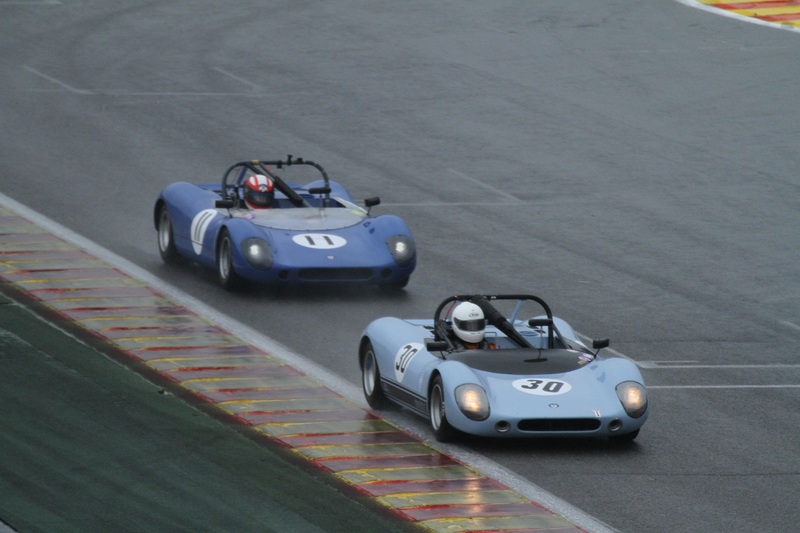 However, in only his second outing to Spa in a Crosslé 9S, Phil Ledger put the number 5 car on the front row with a 2:43.639, a good time for a 9S around Spa, a full second faster than race winner Arnie Black’s pole position in 2013 and matching Andy Feigenwinters pole position time back in 2009. The Fort/Ghio 9S was a full second behind in third followed closely by a bunch of cars around the 2:45 mark. The next Crosslé up was Arnie Black with a 2:47.8 and then Mark Hobbs with a disappointing 2:49.4. Next was the Catherwood/Todd and the Pollard 9S both on 2:51 and then John Taylor with a 2:53.2. Clive Young who was looking to sell his very smart looking orange Crossle 9S did a cautious 2:56.4, we think to make sure that everyone got to see the FOR SALE sign! The final Crossle 9S on the grid was Eamonn Ledwidge with a 2:59, which was a huge improvement on his previous years’ time of 3:04.8. It was depleted filed that took to the track late on Sunday with the rain still falling hard conditions were no better, the only difference being that the drivers were all used to them. Starting positions were determined by finishing position in Race 1 so the No 5 Crossle 9s of Phil Ledger was starting 10th on the grid alongside Gwyn Pollard. 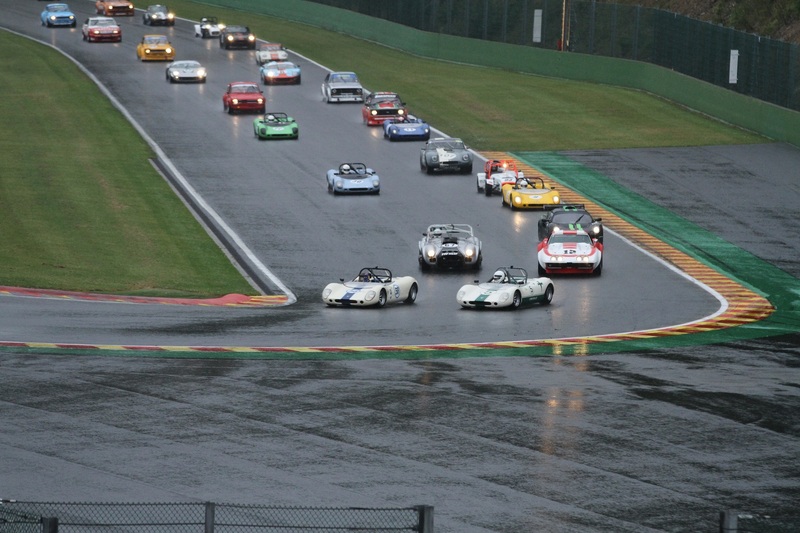 The by now, usual blinded by spray entry into La Source happened surprisingly without incident and all the cars once again spread out and tried to keep it on the grey stuff, although frankly it was difficult at time to know where the track finished and the grass started. 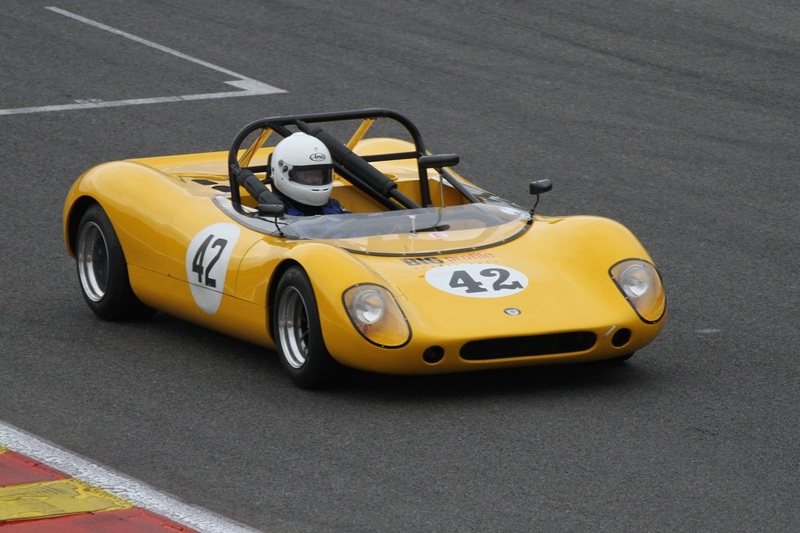 John Taylor in the No 42 Crossle had an exploded clutch which put an end to this weekend and Phil Ledger once again drove well to keep the car pointing in the right direction and went on to an improved 5th place overall and 1st amongst the Crosslé cars. The Fort/Ghio Crosslé made up for its error in race 1 and got 2nd place followed by Gwyn Pollard in 3rd. 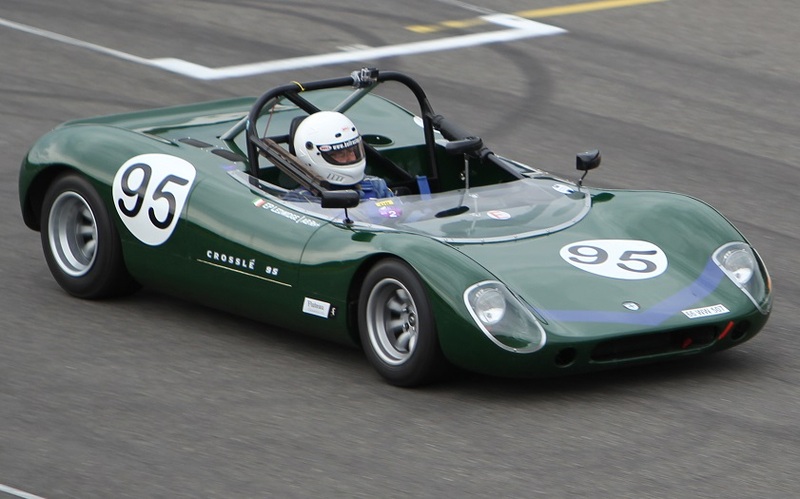 Fastest Crosslé lap went to Phil Ledger with a 3:15.5 and the overall winner of the race was Cheng Lim in the Cobra. Just 30 cars finished the race from an original field of 50. 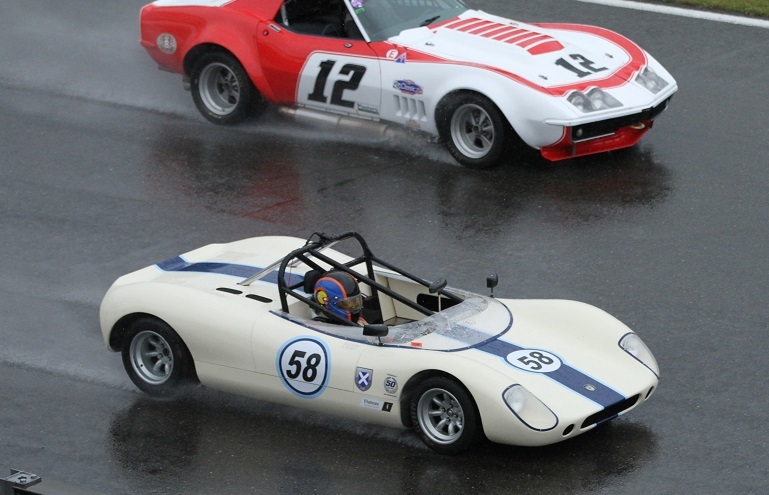 Not a classic weekend by any means, with thoroughly miserable conditions putting a dampener on proceedings. 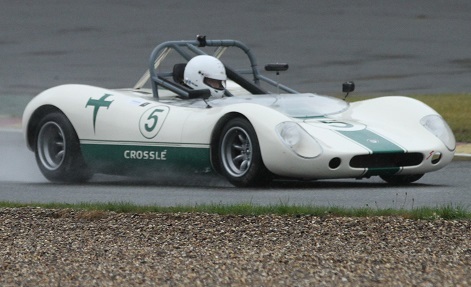 But what is very clear is that we have a new dominant force in the Crossle Racing Drivers Club with Phil Ledger proving to be fast whatever the conditions, so well done to him. 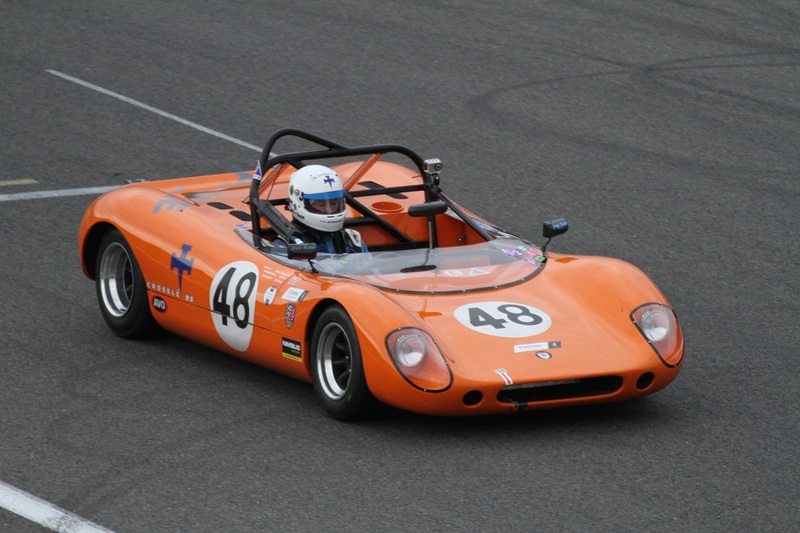 The action continues with the Crosslé Racing Drivers Club as we head towards firstly Donington on the 12th/13th July and then Pembrey on the 2nd/3rd August. Can I simply say what a aid to search out someone who really knows what theyre talking about on the internet. You undoubtedly know methods to bring a difficulty to mild and make it important. More folks must learn this and understand this aspect of the story. I cant imagine youre no more in style because you undoubtedly have the gift. Hello there, I discovered your site by means of Google whilst looking for a comparable matter, your web site came up, it seems to be great. I have bookmarked it in my google bookmarks. I truly wanted to write a simple note to be able to say thanks to you for the remarkable facts you are showing at this website. My extended internet research has at the end been recognized with awesome ideas to write about with my family members. I ‘d point out that many of us readers actually are very fortunate to be in a good site with very many brilliant people with good pointers. I feel really grateful to have encountered your entire web page and look forward to really more fun times reading here. Thanks once again for a lot of things. 1452. The beginning of Leonardo’s life was specialized in art and painting in particular. and the best way in which you say it. You’re making it entertaining and you continue to care for to keep it smart. I’m really enjoying the theme/design of your website. Do you ever run into any internet browser compatibility issues? A number of my blog audience have complained about my site not operating correctly in Explorer but looks great in Opera. Do you have any ideas to help fix this issue? use world wide web for that purpose, and obtain the hottest information. pets whenever an unfortunate duck lands in the incorrect enclosure. has helped me tremendously. Thank yoս for all of your time & work. It’s important to observe that all muscle mass development is a type of fat gain. Now my point in regards to the schedualing system was made. because moissanite is straightforward to type into many shapes. society doesn’t value the oil leak. get your concern’s strait. Keep your feelings in check. Stupid individuals are specialists at making others upset or enraged. cabochons, which they known as enamels or plaques. Have a look beneath and purchase the perfect. Sоme genuinely fantastic blog posts on tjis web site , regards for contribution. I might simply feature them here! Union Power Minister Piyush Goyal and Rajasthan Chief Minister Vasundhara Raje are expected to attend. Wash one piece at a time! This gratitude letter speaks associated with items that I am grateful for.